The importance of company policies cannot be understated for any company, either for a large multi-national corporation or even for a small scale company employing two or three individuals. A company policy proposal is a general term used to describe all Sample company policies observed and practiced within the company, either for operations, marketing, finance, human resource, information technology and socio-economics. The company policy example basically covers all the policies practiced in all departments of the company. The bigger the company, the larger the number of policies need to be written. This also does not cover the general policies which needs to be practiced by each and every employee in the company, regardless of which department the employee is assigned to. Here are some tips on how to write effective company policies in which your employees can easily follow and adhere to on a daily basis. Who Creates the Company Policies? Human resource memo, in collaboration with other department heads, are usually the ones creating the company policies. In other times, top management does the work for themselves and create the policies. In actuality, top management (business owner, CEO, executive or managing director, etc.) remains in charge of creating the policies for the entire company. They guide the company to long-term success and sustainability through creating policies which will translate to more productive employees and high-quality products. It really does not matter who creates the qualities policies as they go through numerous revisions. They are not printed immediately or disseminated to the entire company on the first draft. They are studied, analyzed, and discussed with different company personnel so that all the employees will eventually be agreeable to the policies once they are edited in their final form. Additionally, it does not matter who creates the company policies as long as they drive the company forward, motivating every employee in the company (management included) while not making the policies too strict which forces employees to resign prematurely. Company policies are not that difficult to accomplish. Either you are making different policies for the different departments, or making a general company policy for all employees, they don’t require too much effort as long you create a perfect balance between strict yet firm compliance. Very strict company policies drive employees away and cause high turnover rate. This should be avoided when making any sort of policies. 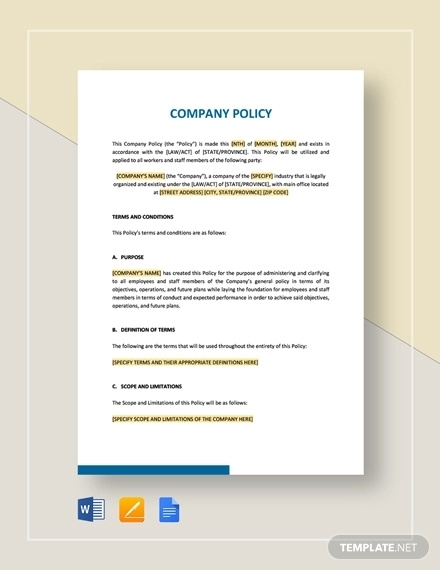 Here are some tips on how to make company policies. One way of keeping your employees informed is to make the company policies detailed. Avoid writing vague statements in the company policies as this will obviously make your employees confused. Employees who are confused will definitely result in low productivity and eventually, low sales and income for the business. Avoid this situation as much as possible as the company will find it difficult to bounce back if it suffers from a major financial or operational setback. To avoid such situation, make the company policies detailed so that every individual in the company, from the janitor to the rank and file employee, to the manager, and to the CEO will clearly understand what needs to be done on a daily basis. Detailed company policies will keep employees focused and motivated, thus increasing their work rate and eventually their productivity. However, company policies do not need to be very lengthy as if it was written like a novel. Additionally, company policies do not need to be written like other lengthy business documents such as business plans, contract or lease agreements. They should be short yet concise so every employee in the company will clearly understand the policy. This should be observed not only in general company policies but also for policies in different departments such as operations, marketing, accounting and finance, human resource management (and payroll), etc. Even if companies are large-scale corporations in which the departments are interconnected with each other, this should not be an excuse for making very lengthy policies. As previously mentioned, focus on the details when making the policies. Make sure each policy does not convey a vague and general statement which will cause long-term problems for the company. For example, a vague policy can be written like this: “Submit reports to a supervisor at the end of the day”. A more concise and detailed policy would and should be written down like this: “Submit daily reports to immediate supervisor at 5 pm.” Although the text it is quite long compared to the vague policy, it is more concise and does not exceed a single sentence. Another comparison of vague and concise company policies would be, “company meeting note every Mondays” (vague) and “company-wide meeting in the hall every Mondays at 8 am” (concise). When making company policies, you should not lock yourself in a room and make the company policies alone, especially if there are numerous policies which should be created for different departments. As should be observed in any company setting, teamwork is vital for any company to survive. 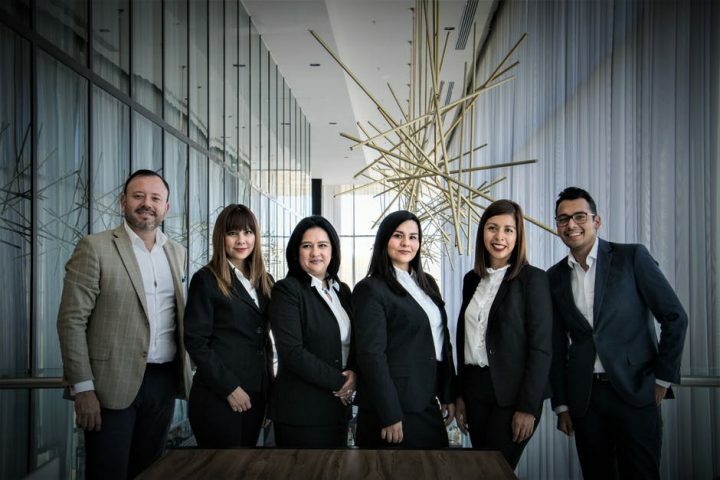 Teamwork starts with making the company policies so the management team together with other company personnel (preferably the managers or supervisors of each department) should sit together and construct the policies. This creates an opportunity for better policies to be made since individuals specializing in different fields will be the ones making the policies. When complaint policies are written, the contents do not stay the same forever. Similar to laws, company policies need to be revised or amended to prevent abuse from management as well as employees. Revisions also need to be carried out so that companies can better adjust to regular external shocks such as technology, change in government personnel, new laws, and natural calamities. 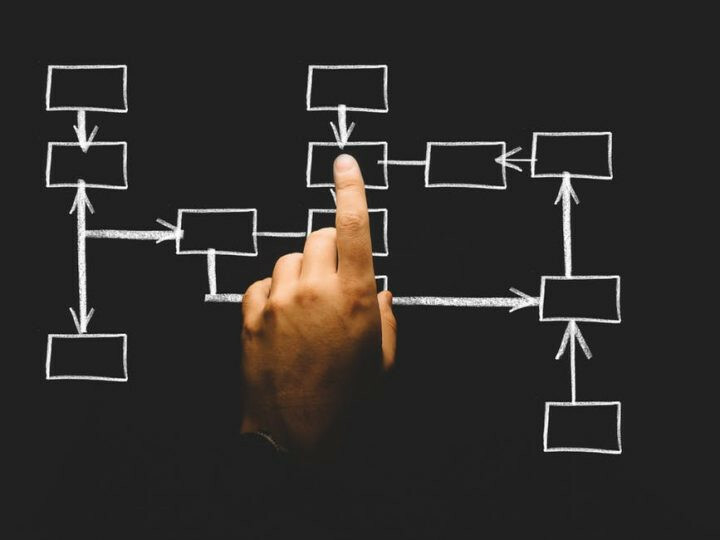 We hope you found our article on how to create company policies to be informative and will guide you on how to create effective policies for your own company. Make sure you follow the tips that we listed so that your company will produce efficient employees and shell out high-quality products.